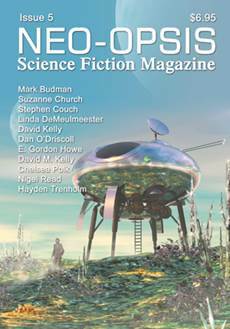 The fifth issue of Neo-opsis Science Fiction Magazine is 8” by 5 ½”, 80 pages. Published on February 3, 2005. Dan O’Driscoll started with dinosaurs. The ones he began drawing in the margins of his schoolbooks as a kid. Later on, he found more legitimate (or at least structured) expression in art classes, and the influence of friends and instructors led to further interests in sketching and painting, and years later to the possibilities of digital rendering programs, which allowed him to create three-dimensional models and environments. His graphite renderings usually depict historical, mythological or fantasy themes, while his colour work (CGI and otherwise) tends toward science fiction and space images. (Cover: Planet Jemm) Dan O’Driscoll won Best Sci-fi for his artwork at Westercon 58, July 3, 2005. Karl Johanson’s editorial this issue is A New Phobia, which includes a cartoon by Karen Kazanowski. Letters to the Editor this issue are from: Terry Bramlett, Steve Stanton, Leslie Peterson, Suisie Hawes, Lucy C. Cruell, Catherine Girczyc, David Mitenko, Bill Smith. This issue’s A Walk Through The Periodic Chart deals with Vanadium. The second story is Inser, by David Kelly. (5517 words – Short Story) David is a post-graduate software engineer whose life has also encompassed conservation work, driving forklift trucks, combat pistol shooting, drag racing, and a spell as a rock musician. He started writing to escape the boredom of the daily commute via train, and Inser is his first short story. He is currently developing Kelltium.com, a company that specialises in software for writers, and is planning to swap the wild moors of Yorkshire, England for the wild nightlife of Sudbury, Ontario in Spring 2005. “Geek” is the “New Cool”, Stories From the Computer Industry by Karl Johanson, and a related Buzz ‘n’ Toffee cartoon by Karen Kazanowski. Warning Label is a short article by Chelsea Polk. Chelsea likes kittens, butterflies, and books. And martinis. And scotch. And long road trips. She lives in Calgary, Alberta, where it is currently cold and miserable, but will be dry and miserable any minute now. An Excerpt From: How I Became a SF Geek is by E. Gordon Howe. E. Gordon Howe was born in Hamilton, Ontario and grew up in the suburbs of Toronto. His early interest in technology led him to a career as an Electronics Technician in the Canadian Navy. He is currently a Petty officer First Class, assigned to the Standards Cell in the Navy’s West Coast Fleet School. The fourth story is A Travelling Companion, by Linda DeMeulemeester. (2644 words – Short Story) Linda lives in a drafty old writerly house with her husband, two sons and requisite cat. This is her second story for Neo-opsis. Linda has stories upcoming in ChiZine and in Cyberpulp’s anthology, Dark Highways. She attended Clarion West 2001. The fifth story is The Wind and the Sky, by Suzanne Church. (3770 words – Short story) Suzanne’s recent writing credits include her story Everyone Needs a Couch, published in Oceans of the Mind, Fall 2003. The seventh story is A Song for Morning, by Hayden Trenholm. (3449 words – Short Story) Hayden is both a playwright and a prose writer. In the past ten years, he has written over 15 plays with productions across Alberta, in Ottawa and on CBC radio. His short fiction has appeared in On Spec, TransVersions, Tesseracts 6, Neo-opsis, Challenging Destiny and on CBC radio. In 1992, Anvil Press published his novel, A Circle of Birds. He lives in Ottawa where he does research for the Senator for the NWT. In News and Reviews, SF News includes the 2004 Aurora Award winners and more, and reviews of Novellas Kath and Mekan’stan, The Apparition Trail, and Ringworld’s Children. The Last Four Pages, Seeing Patterns, by Karl Johanson, is a wonderful article with photo illustrations also by Karl.